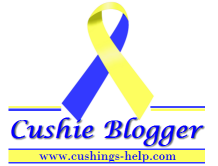 JUST 1 CLICK AWAY FROM EARNING MONEY FOR CUSHING'S RESEARCH! There's a link that's been making it's way around Facebook thanks to our wonderful Cushing's group. If you haven't already, please click HERE to help raise money for Cushing's research through the new drug, Korlym, which blocks cortisol receptors to relive some symptoms of the excess cortisol produced in Cushing's. Corcept Therapeutics will donate $5 for every person who clicks to support people with Cushing's. Corcept has jump-started the effort to build awareness and support with a $15,000 contribution to provide support through the Cushing's Support and Research Foundation and Cushing's Help. With your support, we can aim even higher! * Take part...and spread the word.